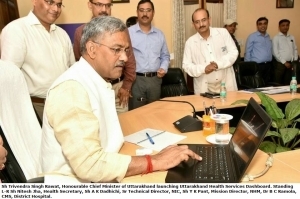 Sri Trivendra Singh Rawat, Honourable Chief Minister of Uttarakhand has launched Uttarakhand Health Services Dashboard developed by NIC Uttarakhand. It is convergence of vital information at a single platform of all those parameters which are significant for maintaining quality health services. Incidentally the description coined for this dashboard by the department is - A tool to monitor the Health of Health Services. 1. Daily footfall of OPD services. It provides trend analysis in form of occurrence of diseases, geographical entities , age groups, genders, type of health institution and over and above The Timeline. Presently 120 (50%) institutions upto PHC level have been covered and brought to this dashboard. Remaining are being targeted for next two months. 2. Doctors Attendance – To have analysis about the engagement of doctors in different type of duties such as OPD / OT-Operation Theatre / PM - Post Mortem / VIP - VIP duty / Yatra Duty / Night Duty and Night Duty Off. And accordingly the management of delivery of services. 3. Patient / Doctors Ratio – Based on the footfall density, trends of duty engagement of doctors and accordingly to address the requirements by authorities. 4. Status and Demand of Drugs warehouse wise - Real time position of drug stocks. Top drugs in demand in state, in districts or different health insitutions. 5. Status of availability of Blood in the state – Blood Bank (both government and private) wise, Type of Blood wise availability of blood units across the state. 6. 108 Emergency Services - Real time - On road, how quick the response time is, number of trips performed and availability of remaining 108 units at present. The information from top can be drilled down further to reach at lowest level through this dashboard. 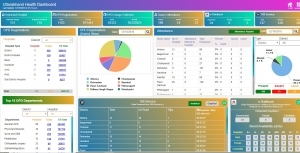 Dashboard is visible to public and government functionaries through http://hrishealth.uk.gov.in/healthdashboard/. The occasion was witnessed by Sri Nitesh Jha, Secretary, Medical Health and Family Welfare, Government of Uttarakhand, Sri Y K Pant, Mission Director, National Health Mission, Director General Medical Health and FW, Sri A K Dadhichi, Sr Technical Director and Sri Arun Sharma, Scientist D alongwith senior officers of CM Office and Uttarakhand Medical Health Department.